This page features short handle style bags from the various designers offered at The Artful Soul. For this page, we show handle bags that may literally have a handle to carry them, as well as shorter straps so the bag is carried by hand, and not on the shoulder. This style is very elegant to wear, and there are no straps getting caught in things. However, many of these offer optional long strap attachments, or handle removal to use as a clutch, so check the item description carefully! Turquoise sky blue color of pebble leather in compact compartment handbag. Measures 9-1/2 x 5-1/2 inches at the reinforced bottom, 7 inches tall at the sides. There is a flap over the top that closes with snap, but this is just an added security. On the front and back are open compartments that also close with top center snap, lined in golden fabric. At center is a full zip-top compartment, also lined in gold. This section has a small interior cell phone pocket and zip pocket. Dual handles. Pale pastel rose pink color of pebble leather in delightfully-shaped compartment handbag. Measures 9-1/2 x 5-1/2 inches at the reinforced bottom, 7 inches tall at the sides. There is a flap over the top that closes with snap, but this is just an added security. On the front and back are open compartments that also close with top center snap, lined in golden fabric. At center is a full zip-top compartment, also lined in gold. This section has a small interior cell phone pocket and zip pocket. Dual 12-inch handles (not long enough for over the shoulder). This bag measures about 12 x 5 inches at the bottom, flairs out to 15 inches across the top. The front has 3 open pockets. Top has full inset zipper with extended tab for full opening, there are 5 wall pockets inside to organize your small items, from a pen to coin purse. The exterior fabric is a rich black burnout velvet with paisley pattern in metallic copper, lime and offblack. Interior lined in gray fabric. Black patent faux leather straps extend for 20 inches above top of bag, starting from base, so this can be worn at high shoulder or carried elegantly. This bag measures about 12 x 5 inches at the bottom, flairs out to 15 inches across the top. The front has 3 open pockets. Top has full inset zipper with extended tab for full opening, there are 5 wall pockets inside to organize your small items, from a pen to coin purse. The exterior fabric is smooth weave in ivory with contemporary chocolate and red floral motif. Interior lined in brick red fabric. Chocolate faux leather straps extend for 20 inches above top of bag, starting from base, so this can be worn at high shoulder or carried elegantly. Reinforced fabric handbag measures 11 x 6 x 4-1/2 inches. Burgundy wine solid woven fabric is covered by intricate embroidered patterns in natural ecru thread. "Damai" means "Peace" in the language spoken by the Banda Aceh villager who made this bag. Front and back have full open pockets to which the short wrapped cord handles attach with chrome hardware. The main compartment has inset zipper top, interior lined in burgundy satin with cell phone and small zipper pocket. Classic handle bag, made with beautiful leathers in a pebble texture matte black, reptile printed light olive/espresso/black. Measures 10 x 3-1/2 inches on flat leather base, 6 inches tall. Chrome frame has black top edging that really adds defining elegance, secure clasp to close. On the front is the heavily embellished FLAP that has hidden magnetic closure over an outer pocket! The embellishments are metallic and glass beads in silver, bronze, jet, olive colors. Interior lined in olive green fabric with open pocket, plenty of room for personal items. In addition to black handle for elegant carrying, there is a silvertone shoulder chain that can be attached/detached. This small bag can be your go-to bag when you don't need to carry the entire household with you! Measures 8-1/2 x 5-1/2 x 2-1/2 inches. The soft dark eggplant purple leather has tooled designs, then cutout areas to reveal smooth fuchsia-purple leather underneath. Topstitch detailing. Full zip top opens to black/gold scrolling pattern fabric lining. There is a cell phone pocket and zip pocket. Two strap options are thin folded leather, detachable, a choice of 16 inches or 46 inches. You could even join together if you need it even longer, or attach the smaller one in a loop to carry as a wristlet clutch! Yummy soft reptile texture leather bag, in a perfect size for lunch into evening. The leather has embossed snake print, dyed in deep tomato red with glossy finish. Minimal hardware is golden brass finish. Yummy soft reptile texture leather bag, in a perfect size for lunch into evening. The leather has embossed snake print, dyed in deep and vibrant ruby raspberry hot pink with glossy finish. Minimal hardware is golden brass finish. Yummy soft reptile texture leather bag, in a perfect size for lunch into evening. The leather has embossed snake print, dyed in deep orchid purple with glossy finish. Minimal hardware is golden brass finish. Yummy soft reptile texture leather bag, in a perfect size for lunch into evening. 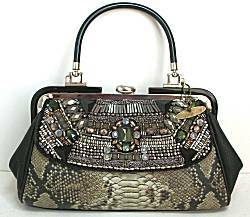 The leather has embossed snake print, dyed in python pattern colors of espresso brown into gold and beige with glossy finish. Minimal hardware is golden brass finish. Carry handle attached is pebble texture black leather with comfort wrap. Yummy soft reptile texture leather bag, in a perfect size for lunch into evening. The leather has embossed snake print, dyed in deep jet black with glossy finish. Minimal hardware is golden brass finish. Yummy soft reptile texture leather bag, in a perfect size for lunch into evening. The leather has embossed snake print, dyed in creamy champagne beige with glossy finish. Minimal hardware is golden brass finish. Yummy soft reptile texture leather bag, in a perfect size for lunch into evening. The leather has embossed snake print, dyed in rich chocolate brown (like warm dark walnut wood) with glossy finish. Minimal hardware is golden brass finish.